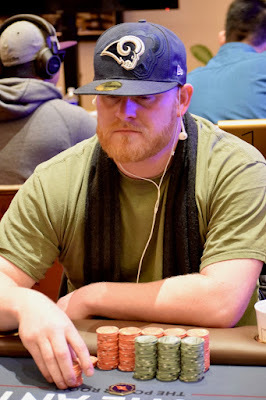 Chipleader with 28 left, Shayne Crum (above) saw his stack go the wrong way from about 15 players on. All in for just 2BB, Crum draws calls from Eric Matulis, Denis Lee and Hafiz Khan. An all-spade K-7-5 flop is checked around, as is the deuce turn. A fourth spade - a 3 - falls on the river and all three still check. Crum turns over two red Sevens, he flopped a set but he doesn't like the river at all. Matulis shows pocket Eights with a spade ... a flush, but he's 2nd-best, as the King_Queen of Jackson also has a spade. Crum is out in 7th place - a $12,343 cash, then he has a scare when he thinks he's lost his wallet. That scare is short-lived, and off to cash in he goes.